Concordia and former Massachusetts Lieutenant Governor Kerry Healey have partnered to bring Millions in the Middle to the 2018 Concordia Annual Summit in New York City on September 24th 2018. Convening during the United Nations General Assembly (UNGA), Millions in the Middle will bring together the most prominent activists, thought leaders, candidates and funders working in the Bipartisan, Good Government and Centrist spaces. Operating as a Summit within the larger Concordia Annual Summit, Millions in the Middle will offer a day of Roundtable discussions, a networking lunch, and an opportunity to hear from leading centrist candidates. Featuring Colorado Governor John Hickenlooper as its keynote speaker, the event’s objectives are to discuss common challenges and amplify one another’s impact as a movement. Healey believes that Centrists of all affiliations have an urgent obligation to speak up against today’s politics of division, and that by working beyond traditional party boundaries, there is a pathway to re-unite America around a shared political heritage that cherishes democracy, freedom and equality and advances dignity and opportunity. This programming will bring together Centrist viewpoints to identify specific trends influencing American politics today, as well as explore at a deeper level what motivates candidates, campaign financiers, and political activists ahead of the 2020 elections. This is a unique opportunity to engage with pragmatic leaders critical to this space about the millions of Americans dissatisfied with today’s political environment, including organizations like SAM, Issue One, No Labels, the Leadership Now Project, and Unite America, as well as Bill Kristol, Director of Defending Democracy Together and editor-at-large of The Weekly Standard. 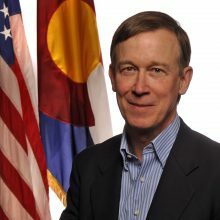 John Hickenlooper is a former geologist and entrepreneur, who added “author” to his resume with the publication of his memoir, The Opposite of Woe: My Life in Beer and Politics. He champions innovation, collaboration and efficiency. When he was inaugurated Governor of Colorado in 2011, having run on his history of collaboration for community good, he became the first Denver mayor to be elected governor in 150 years. He also became the first geologist to become a governor in the history of the nation, and the first brewer since Sam Adams in 1792. Again he has recruited talent from all quarters, and is redefining the relationship between a state government and its business and civic communities. Since taking office in 2011, the Governor and his team have endeavored to make Colorado the most pro-business state, with the highest environmental and ethical standards. He is a great believer that governors, far more than Congress, can revive American democracy. As part of the Romney-Healey Administration from 2003-2007, Healey introduced, enacted and implemented a broad range of policy and legislative initiatives focused on criminal justice reform, drug treatment, combating homelessness and preventing drunk driving, sexual assault and domestic violence in the Commonwealth of Massachusetts. She proudly contributed to the Administration’s successful, bi-partisan, first-in-the-nation health care reform legislation. Healey took office as President of Babson College in July 2013, where she has increased the College’s global reputation as the #1 ranked college for Entrepreneurship education. Healey believes that access to education is essential for gender equality and advancing global prosperity; she serves as a Trustee for the American University of Afghanistan in Kabul and the Prince Mohammad bin Salman College of Business and Entrepreneurship in KSA. She holds an AB in Government from Harvard College and a PhD in Law and Political Science from Trinity College, Dublin. She is a member of Concordia’s Advisory Council.